Sleep in a mask? I never thought it was possible or even good for my skin to let a product sit so long on my skin. Then I came across the Korres Greek Yoghurt Advanced Nourishing Sleeping Facial and the Origins Drink Up Intensive Overnight Mask. Both of these products are meant to be worn while you're sleeping, so the nutrients and ingredients really sink into your skin. Our skin works to repair itself while we're asleep -- letting it do its own thing for 6-9 hours a night really goes a long way. So it makes sense that there are products out there formulated just for this purpose! I began by trying the Origins Drink Up Intensive Overnight Mask (seen above). You're supposed to massage it into the skin, tissue off excess and wake up with a refreshed, glowing complexion. Rather than tissuing off any access, I've been letting all of it sink into my skin overnight. But, WOW, what a difference! Before I started using Drink Up, my skin was drier than the Sahara -- cracked, peeling, flaking, you name it. But thanks to avocado, apricot kernel oil and Japanese seaweed, my skin is now hydrated beyond belief. This mask is meant to be used 1-2 times per week. I've been using it every Wednesday for the past three weeks and it's definitely made a huge difference! 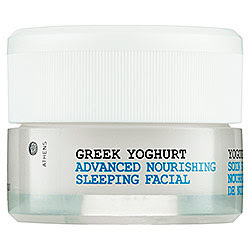 Then it was time to try the Korres Greek Yoghurt Advanced Nourishing Sleeping Facial. I'm normally not a fan of coating my skin in heavy cream before bed, since it tends to clog my pores and create breakouts. But I've long loved Korres, and I trust the brand's products implicitly, so I decided to give it a try. Color me impressed! The Greek yoghurt provides proteins, minerals and vitamins to the skin and immediately hydrates and nourishes. I've been using this 1-2 times per week, and my skin has never looked or felt better -- and not a pimple in sight! I am obsessed with the new Korres yoghurt sleeping mask! I have used the Wild rose and Vitamin c sleeping mask and moisturizer religiously and I use this now every other night-I haven't broken out and my makeup glides on the next day! LOVE this!